In 1492, Genoese mariner Christopher Columbus set sail from Spain with his little fleet of ships, determined to find the western passage to Asia. While he never found such a passage, he did stumble upon what we now know as the Bahamas, Haiti, the Dominican Republic, and Venezuela. Last year, we told you 5 Things You Need to Know about Columbus himself. 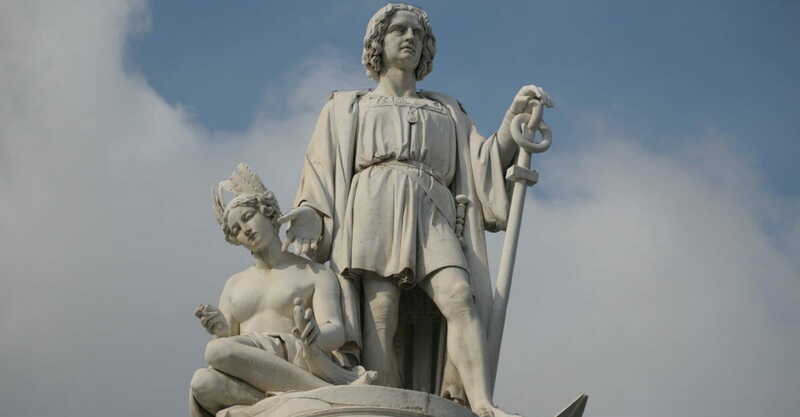 Now, here are some intriguing facts on the history of Columbus's legacy. Christopher Columbus was a much needed beacon of hope for early Italian-Americans. More than 4 million Italian migrants came to the U.S. in the late 19th century seeking money, employment, and new life, and were often met with suspicion and hostility. Many in the U.S. claimed that Italians were a lower, more barbaric "race" and should be denied citizenship. Eventually, Italian-American communities began to develop ways to honor their heritage by celebrating old world traditions and great Italian innovators, such as famed explorer Christopher Columbus. Columbus's achievement was an inspiration to these oppressed enclaves, and throwing a festival in honor of his achievements helped them remember Italian greatness and keep their pride alive during hardship and discrimination. Columbus was not only a skilled mariner and brave explorer, but "a man of deep faith," according to Dr. Carey Roberts, History Chair at Liberty University. Even in his final years, he "hoped to expand the ministry of the Gospel to the New World." In spite of the limited knowledge, flaws, and failures of Christopher Columbus, it's no wonder that such a figure would bring hope and inspiration to so many. "A day upon which may be gratefully recognized the patriotic Americanism of the Colorado Italians whose generosity prompts them to present to the state an emblem of appreciation of the services to mankind of one of their countrymen, and a material evidence of the good citizenship of those Americans who belong to the same race as he did." The holiday on the second Monday of every October may be a United States event, but Columbus is celebrated by many other countries around the world. Various Latin American nations recognize Dia de la Raza, commemorating the meeting of European and Native American culture. Venezuela, Costa Rica, and the Caribbean islands have celebrated Columbus's legacy in an official capacity for many decades, many of which in recent years have evolved into celebrations of national heroes and cultural pride. Spain includes Columbus in its celebration of "National Day," Italy has celebrated his voyages since the 18th century, and Columbia? Well, one guess as to who inspired that country’s name! For as often as we've heard that "Columbus discovered America," we all know by now that that isn't true. According to Dr. Roberts, "Archeological evidence seems to now point to African and Europeans inhabiting some parts of the Americas even before the arrival of the ancestors of Native Americans." After that came Vikings from Europe and fishermen from the Iberian peninsula. The most famous Viking to make it to North American soil was Leif Erickson, Norse explorer who founded a settlement in present-day Canada. Erickson, while much less prominent in popular culture than Columbus, has his own holiday on October 9th, first instituted at the federal level in 1964. 5. "Your Honor, I Object!" Hawaii, Alaska, Oregon, and South Dakota do not recognize or celebrate Columbus Day. Instead, Hawaii instituted Discoverers’ Day "in recognition of the Polynesian discoverers of the Hawaiian Islands" and Native American Day is celebrated by South Dakota in lieu of Columbus Day. In fact, with every passing year it seems more and more objections are raised against a holiday celebrating a man who apparently brought even more death, destruction, and slavery to the already turbulent indigenous populations of the West Indies. Berkley, California started celebrating Indigenous Peoples' Day in 1992, and many cities, including Minneapolis-Saint Paul and Seattle, have since followed suit. Rachael Stoeve at Yes! magazine writes, "The reimagining of Columbus Day is an opportunity to understand the history and legacy of colonialism, honor the cultures and lives of First Nations peoples, and move forward in the struggle to end oppression." North America has a rich and complicated legacy, filled with men and women of all characters and stripes, many of whom we will never know about (or only discover through diaries and journal entries). As we celebrate historical milestones, it’s important to remember that Kings and Captains are often equal parts noble and greedy, and that countries are born out of both bravery and bloodshed. Dr. Roberts explains, "Like any entrepreneur, Columbus's faith and his daily life did not always follow hand in hand. However, Columbus—and Queen Isabella of Spain who funded his first voyage—were deeply concerned with moral and Christian reflection."